"For its part, the Giro del Trentino reinforces its territorial nature, joining a brand that is based on human values, moral and strong ties to the territory." The Giro del Trentino and Trofeo Melinda have officially merged.Following negotiations between the two organizing companies, the GS Alto Garda and the Melinda Consortium , it was decided to merge the two races in order to survive the economic crisis and to continue the growth of their events that have always had attracted lots of good riders. 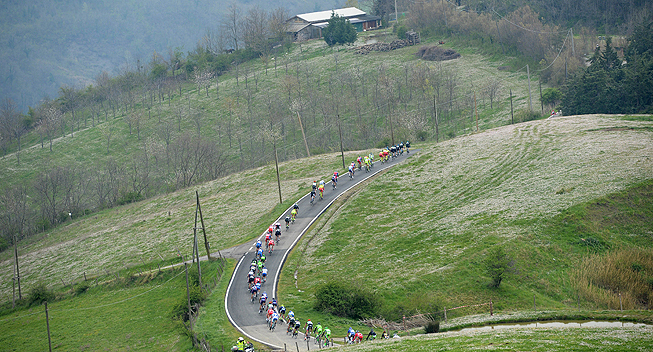 In 2015, the Giro del Trentino - Melinda will be held from April 21 to 24 and will end in the Val di Non with a stage that would also include the Val di Sole. "For over 20 years, thanks to the commitment of the late Marco Brentari, Guido Ghirardini and a group of enthusiasts, Melinda has had its name linked to cycling, helping to create a one-day race," Michele Odorizzi , president of the Consortium Melinda, said. "Today the agreement with GS Alto Garda allows us to continue our presence in cycling and in our area, combining forces with another major sporting event that takes place in the province. We are convinced that the choice is an excellent solution." "I believe that the agreement gives a added value for all, Giacomo Santini, President Alto Garda, said. "For Melinda it is an opportunity to consolidate their presence in cycling and show theire brand for four days in an event that has a good international reputation. For its part, the Giro del Trentino reinforces its territorial nature, joining a brand that is based on human values, moral and strong ties to the territory."